Originally founded in1895, Reigate School of Art has a unique heritage of having successfully provided creative education for nearly 125 years. 1895 – The Redhill Technical Institute came into being incorporating Reigate – Redhill Art Classes. 1937 – It was upgraded to a Technical College and the school of arts and crafts relocated to Reigate. 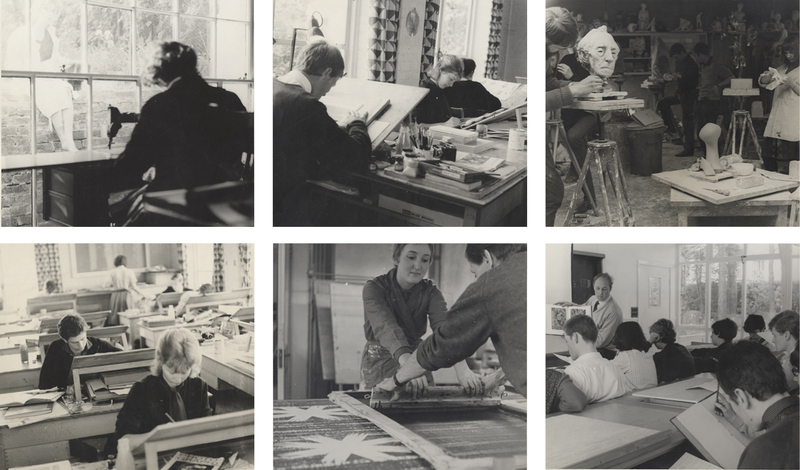 1938 – Reigate – Redhill Art Classes achieve ‘Art School’ status and become Reigate and Redhill School of Arts and Crafts. 1948 – Request for additional classrooms at the Blackborough Road site due to growth in student numbers. 1983 – Redhill Technical College and the Reigate and Redhill School of Arts and Crafts became East Surrey College. 2002 – School of Arts and Crafts relocated from Reigate to a new building on the main East Surrey College campus in Redhill and was renamed Reigate School of Art, Design and Media. 2010 – the new state-of-the-art East Surrey College building was completed. 2015 – the Reigate School of Art, Design and Media becomes Reigate School of Art. 2019 – East Surrey College, incorporating Reigate School of Art, formally merged with John Ruskin College to form the overarching College Group: Orbital South Colleges.